Bring a pot of water to a boil. Add potatoes and cook for approx. 20 min., or until knife-tender. Meanwhile, clean and halve the mushrooms. Peel and slice onions. Clean and slice zucchini. Clean bell peppers, cut in half, remove the seeds, and cut into thin strips. Bring another pot of water to a boil. Break broccoli into small florets and cook for approx. 3 min., or until firm to bite. Rinse with cold water and pat dry. Peel and slice boiled potatoes. Slice sausages and put them on toothpicks. Cut chicken breast and beef into bite-sized pieces. Peel and mince garlic. Zest and juice lime. Finely grate ginger. In a bowl, mix garlic, ginger, lime zest, and juice with olive oil, soy sauce, and chili flakes. Stir to combine and marinate chicken for 2 hrs. Peel and dice shallot. In another bowl, mix shallot with beer, mustard, and honey, and marinate the beef in it for 2 hrs. Peel and mince garlic. Chop jalapeño. In a small bowl, add ketchup garlic, jalapeños, Worcestershire, sauce and horseradish. Stir to combine. 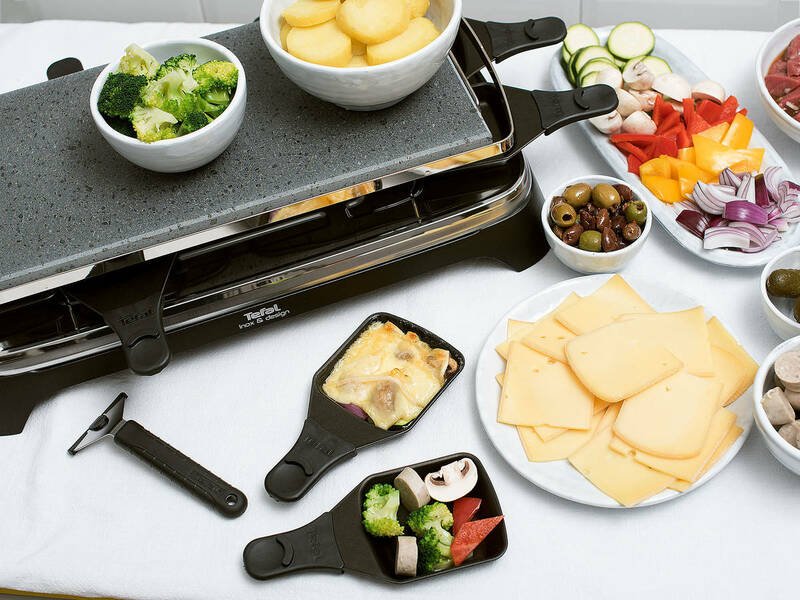 Using a raclette grill, grill potatoes, vegetables, sausages, chicken, and beef, and serve with spicy ketchup and raclette cheese. Enjoy!